I believe this is the Gulf-Mirage M-6 that raced in 1973. 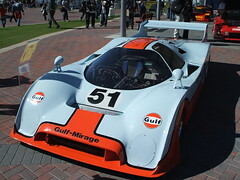 This was one of John Wyers cars in the famous Gulf sponsored livery. JWA raced Ford GT-40's, Porsche 917 and the Mirages using this famous color scheme during the late 1960's and early 70's. The M-6 was introduced in the eary 70's and were powered by a V8 Ford/Cosworth engin setup that produced 445 horsepower. They raced in the Group 5 Sports Car class (IMSA) and made its first appearance in the 1972 12 Hours of Sebring. Previous versions of the Mirage dated back to the M1 model in 1967. There are only 5 or 6 left today.